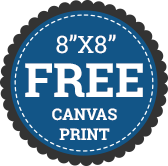 Receive an Absolutely Free 8"x8" Canvas Print for Every Friend you invite to CanvasChamp! Send out recommendations to your friends and family using FaceBook, Twitter, and email or even embedded directly into your blog or website. When you share your purchase with your friend, you get rewarded with one 8"x8" canvas print absolutely free for first order placed by referral. Additionally, you get rewarded with N$5 for each order placed by referral. Give your friends 85% off + Free Standard Shipping. If you've loved the CanvasChamp experience, we’d love to work with your friends. When you refer your friend, they will get 85% off + Free Standard Shipping on their first order. Let’s help them get started to receive this great offer. In return, when you share your purchase with your friend, you will get rewarded with an absolutely free 8"x8" size canvas print when your referral places their first order. In addition, you will receive N$5.00 for each order placed by your referral.